I will introducing some concepts about how the main ITG frameworks, models and practices are connected and their proposal to running together. 1 – The ITG is supported for laws, principles and forces. The main law is Sarbanes Oxley (well know as SOX) which determines how an enterprise should to govern theirs departments and ensure the controls for objectives and goals in a transparent way. 2 – The COBIT is a ITG framework with focus in Governance and Management which say, for example, what to do for having yours IT process aligned with business proposals, it is well know either. However, with their new version it is taking in abstruse and the people are thinking about how it is going to be a effective way for IT governance in the future. 3 – The COBIT as far as models, such as ISO or CMMI , has very high abstractions of a set of activities in the enterprises, which can to turn it into the problems, as result of their big bad integration with other management or governance model adopted by your enterprise. 4 – What to do it?. No longer of COBIT, the ITG process in the enterprise within, are compelled to follow generics and specifics practices, models and patterns adopted for ensure objectives and goals though a set of activities. 5 – Thus, how is it running now? . The manager question for their subordinates. How to do ? They though go back to the manager. The answer is on the enterprise architecture. Why? Let’s go on afterwards!! 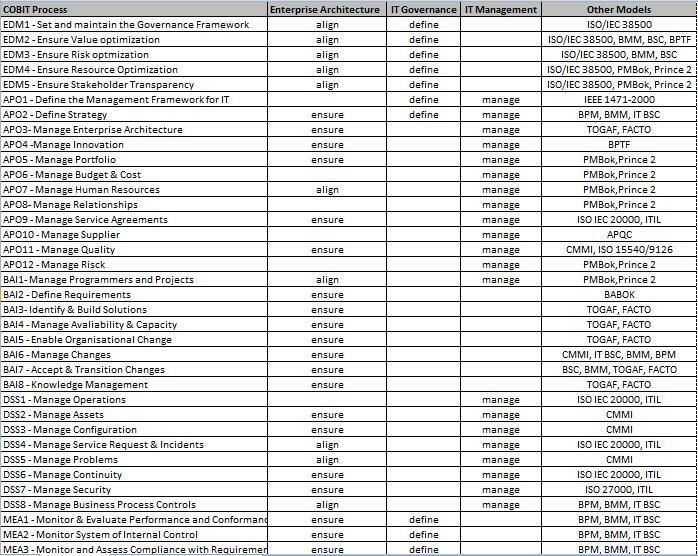 6 – With the COBIT 5 been building aligned both governance and management IT models, you can to see here, I figure out analyzing the whole COBIT 5 processes that enterprise architecture ensure 60% of their effectiveness. 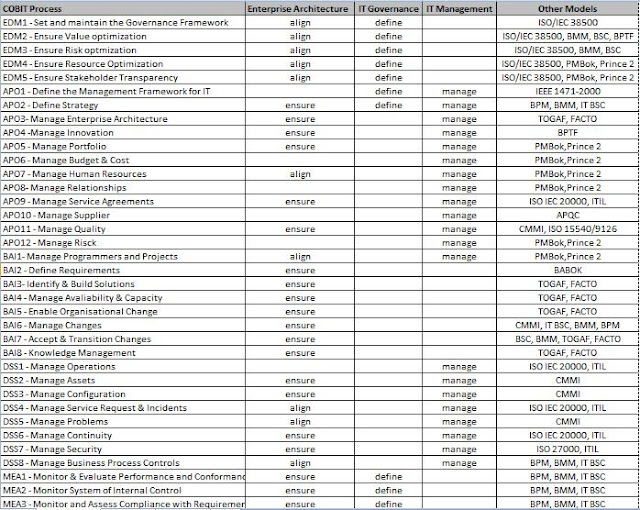 7 – Looking around of columns, we can see that governance and management activities only align and define the whole thing, but what realizes everything is the enterprise architecture. 8 – As matter a fact, I would to ask you, if you having the big picture of this before?. Or a closed image about how will be theses frameworks bringing together? . 9 – I would to ask you, why use a best practices which using other best practices use 60% of their effectiveness toughly instead?. You can to use an enterprise architecture framework like as FACTO or TOGAF and to adapt the other 40% sequentially in according with your necessity.